True Blue® PVC, CPVC, PVDF, PP & PTFE Check Valves help you stop unwanted reverse flow with an automatic bubble-tight seal. • Series CKM & CK Diaphragm operated; self-sealing and normally-closed. • Series CKS PFA encapsulated spring designs; self-sealing and normally-closed. • Series CKD Compact design for low pressure applications; not self-sealing but has lower cracking pressure. All True Blue Check Valves feature rugged thermoplastic construction with no wetted metal parts. As your assurance of quality, each valve is individually tested under pressure by a Plast-O-Matic inspector prior to shipment. Diaphragm Check Valves are Superior to "ball checks"
The patented diaphragm in the Plast-O-Matic True Blue Check Valve is designed to re-seat with a bubble tight seal regardless of mounting position or reverse flow. Ball style check valves require two properties to seal properly: First, the ball check must be mounted with the flow direction pointed up, because gravity is required to pull the ball to the seat. Secondly, some reverse pressure and flow must be present, because pressure is required to seal the ball exactly on the seat. If either of these conditions are not met, the ball check will leak! On the other hand, the Plast-O-Matic diaphragm check will seal in any position, whether or not flow is present. Here's a Simple Test: Take a Plast-O-Matic diaphragm check valve and place it flow arrow up on a paper towel. Pour a small amount of water into the outlet, lift up the valve, and you will see that it has remained absolutely sealed -- no evidence of dampness on the paper towel. Now take any ball-style check valve and perform the exact same test -- just be sure to have extra paper towels on hand! Compare ball checks to our patented diaphragm check! Unsurpassed performance in a plastic check valve. Patented diaphragm design provides the ultimate normally-closed, zero reverse-flow valve. Available pipe sizes 1/2" 3/4" and 1". Body materials are Geon® PVC, Corzan® CPVC, Glass-filled polypropylene, and Kynar® PVDF. Seal materials are EPDM and FKM. • Self-sealing -- not dependent upon gravity, mounting position or reverse flow. • Leak-free sealing protects against the hazards of reverse flow. • Rapid closure helps to eliminate sudden back-flow water hammer. • Union nuts simplify inspection/removal with minimal piping breakdown. • Minimal Cracking Pressure: Valve begins to open for desired flow at approximately 1.0 to 1.5 PSI. • Maximum working pressure is 150 PSI inlet, 100 PSI backpressure at 77° F, except Glass-filled polypro which is rated 100 PSI inlet. • No metal parts internally or externally. 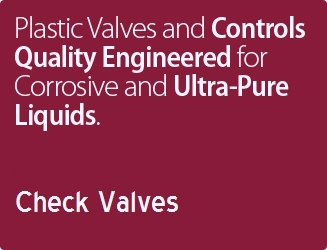 Unsurpassed performance in a plastic check valve. Patented diaphragm design provides the ultimate normally-closed, zero reverse-flow valve. Available pipe sizes 3/4" and 1". PTFE Body; seal materials are EPDM and FKM. • Generally the same as Series CKM. Series CK is simply a PTFE bodied version with the same diaphragm design and performance of CKM, but it has no union nut feature (Body requires wrench for disassembly and seal replacement). • Maximum working pressure is 40 PSI inlet, 40 PSI backpressure at temperatures to 185° F.
• No internal metal parts; external fasteners are stainless steel. 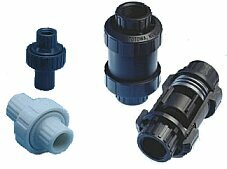 Unsurpassed performance in a plastic check valve. 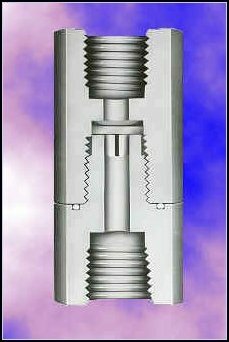 Unique poppet and PFA encapsulated spring design emulates the CKM diaphragm and provides the ultimate normally-closed, zero reverse-flow valve. Available pipe sizes 1-1/2" 2" and 3". Body materials are Geon PVC, Corzan CPVC, Natural polypropylene, and Kynar PVDF. Seal materials are EPDM and FKM (Viton). • Maximum working pressure is 100 PSI at 77° F.
• No exposed metal parts. Spring is PFA encapsulated steel...note that this is preferable to coating; encapsulation eliminates the possibility for "flaking" and exposure of the metal. No other metal parts are used. These 1/4" & 1/2" valves utilize a flexible elastomer disk as opposed to Plast-O-Matic's patented diaphragm. The advantage is that the CKD requires even less pressure than the CKM to open. The drawback, of course, is that it is dependent on some reverse pressure for sealing assistance, and in low flow applications requires gravity to seal (install with flow direction "up"). But please note that when used for liquids with a high specific gravity, the disk may "float," so it is therefore recommended to install with flow direction "down" with those types of liquids. Also note that in 1/2" piping systems where high flow is required, the 1/2" Series CKM check valve should be used, unless the super low cracking pressure of Series CKD is absolutely a requirement. Flow performance of 1/4" size exceeds the recommended flow rates for fractional size tubing. • Very compact; slim design -- not much larger diameter than corresponding pipe size. • Sizes 1/4" & 1/2". • Seals in EPDM or Viton. • High performance, heavy-duty design. • Maximum pressure is 140 PSI in PVC, 125 PSI in natural polypro, and 100 PSI in Kynar and PTFE. • Minimal cracking pressure required. The operating principle of check valves and vacuum breakers is identical: both are one way valves that open only in the direction you desire, and remain closed under reverse pressure. 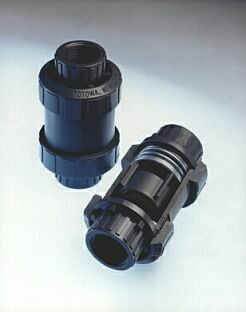 But the specific use of a check valve in place of a properly capped vacuum breaker is not recommended -- unless it is used in combination with a pipe (in lieu of the dustcap) for drawing air or other desired fluid from a remote location, or in combination with a pipe to "vent" emissions in the event that a valve sticks open due to trapped debris. If, as in most applications, you are simply mounting the valve on top of a tank to use as a vacuum breaker, it is recommended to use a Plast-O-Matic Vacuum Breaker designed for that purpose. The specially fitted and tested dust cover prevents unwanted particles from entering the tank, and also prevents errant debris or tools from lodging in the valve and opening it. Just as the check valve remains closed against reverse flow, the vacuum breaker diaphragm (Series VBM) or poppet (Series VBS) remains closed regardless of the pressure within the tank. As negative pressure is created, however, the vacuum pulls the valve open, and atmosphere is drawn in. As soon as the vacuum condition is eliminated by an appropriate amount of air drawn into the tank, the lack of negative pressure on the diaphragm causes it to close again. • Series VBM is based on CKM, above, in sizes 1/2", 3/4" & 1". 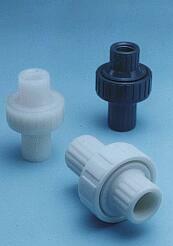 • Series VB is a based on CK, above, PTFE only in sizes 3/4" & 1". • Series VBS is a very high capacity vacuum breaker based on CKS, above, in sizes 1-1/2", 2" & 3". Vacuum breakers should always be scheduled for regular inspection to ensure that the valve seat is free from debris and that the opening mechanism will perform properly. Sometimes users will install a check valve after a pump, in a line with a significant altitude drop downstream of the check valve. Their intention is that when the pump is switched off, the absence of positive flow will cause the normally-closed check valve to close -- and it will indeed close. But because of the system design, a pressure drop is created, resulting in negative pressure: A vacuum. Because this type of check valve is the basis for an extremely effective vacuum breaker (see above) it naturally opens, and permits unwanted flow through the pump head and is now a fully open check valve. In this type of application, an Anti-Siphon Valve is the correct product to use. The anti-siphon valve can be set to open at higher pumping pressures, and actually closes more tightly in the event of negative downstream pressure. • Please click here if you need to know more about anti-siphon applications; please click here for a web page on Series RVDT Anti-Siphon Valves. 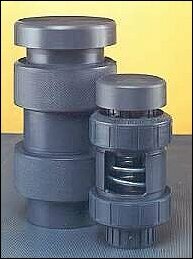 Plast-O-Matic normally-closed check valves are ideal for maintaining pump prime when the liquid source is below the elevation of the pump. Series CKS or CKM should be installed between the pump and the lower elevation source, permitting flow to the pump but not back to the tank. The valves thus provide a bubble tight seal to trap liquid in the pump, preventing loss of prime. The check valve most suited to this application is Series CKS. As listed above, Series CKS uses a PFA encapsulated spring and poppet to provide a positive, repetitive seal. 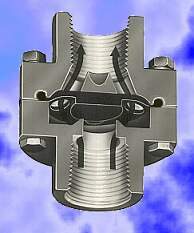 This enables the valve to close with less liquid loss, and provides greater versatility in system design. High capacity check valves 1-1/2", 2" & 3"
Special compact diaphragm check valve that is ideally suited to very low pressure applications. This is the only True Blue check valve that is not based on the normally-closed concept. or simply call 973-256-3000 and request any of our Check Valve Catalogs. Note: For complete information contact our Technical Sales group at 973 256-3000 to discuss your specific needs, or please use the "Request for Quote" link to initiate the process.